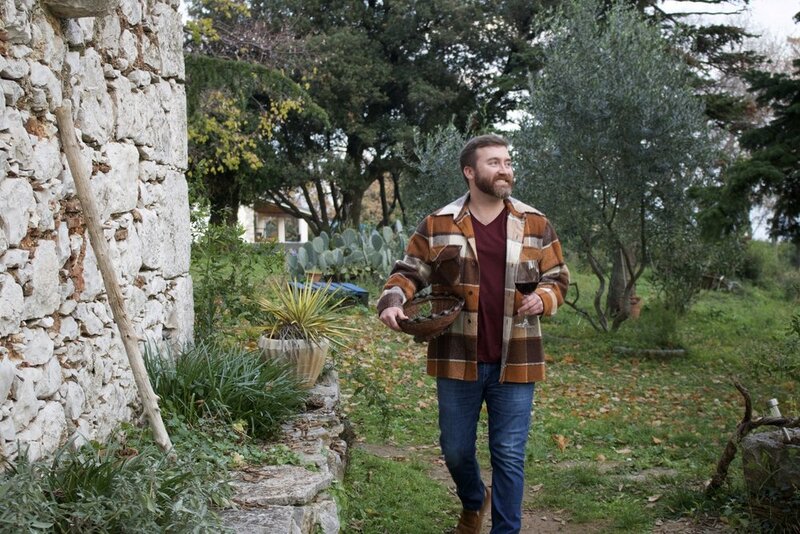 When we do these wine travel trips, we're often on the road. Go, go, go! One time we put nearly 5,000 km on the car. I think the rental agency hates us. We love our little Airbnb finds and we've lucked out with some fantastic homes. 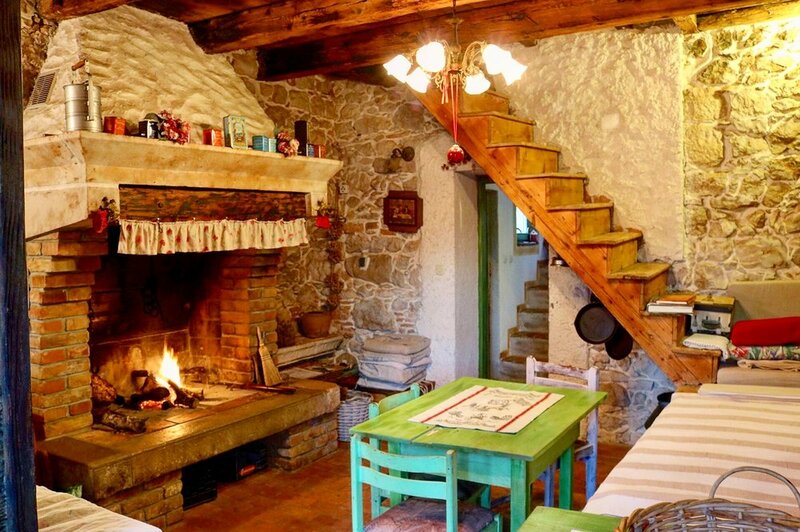 When planning one of our rural retreats we've developed one particular requirement: It must have a kamin or a rostilj (an indoor or outdoor cooking fireplace, respectively. These are fairly common in Croatia, especially outside the cities.) Oh! And a sauna or hot tub is an added bonus. This most recent trip found us in a restored tower in eastern Istria, on the shore near the town of Labin. The place didn't even have heat in the kitchen, so we had to keep it warm with a wood fire. Of course we loved it and used it for nearly all our cooking. 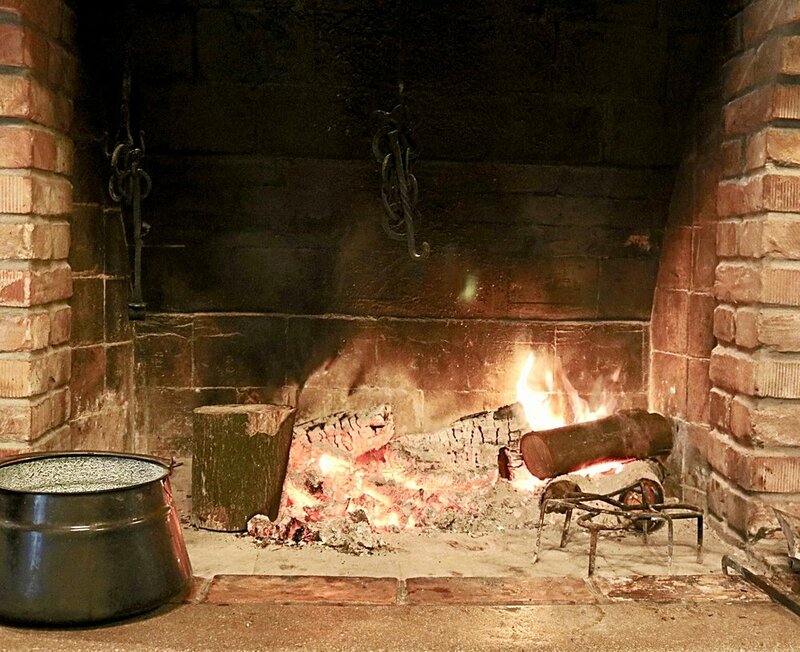 The hearth became the inspiration for our meals, and specifically, for this rustic stew. We're going to share with you an afternoon and evening in the life of our dream world. 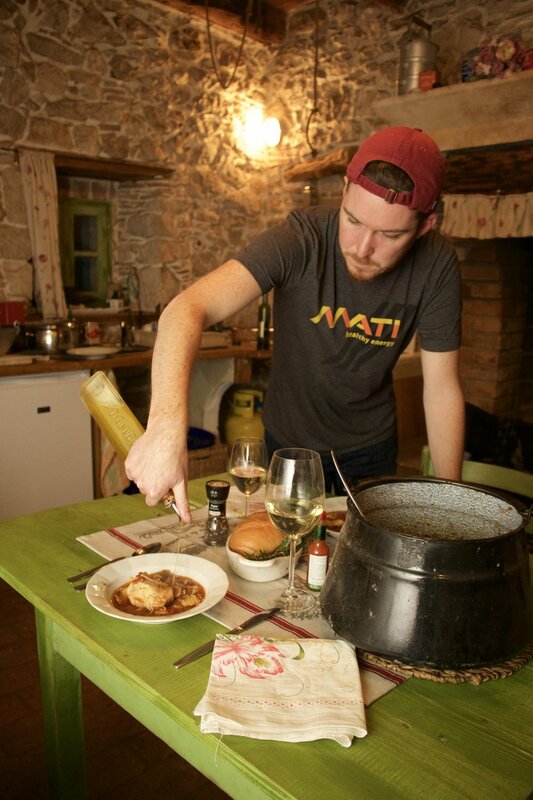 Come along as we make a "Rustic Istrian* Stew." *It's not necessarily a traditional Istrian stew, but as we were in the region and gathered most of our herbs from around our Airbnb, we're going with it. Of course one must have wine while picking herbs. This is not a recipe, per se. It's a very basic soup that you can change any which way you like. Add, substitute, and eliminate ingredients to your heart's desire. If you don't have an indoor or outdoor cooking fireplace, you can set up a makeshift (or build a permanent one!) fire pit for cooking. Just be sure to have an appropriate heavy-duty metal or cast-iron pot (no rubber handles, here). meat, brown it in some oil, butter, or oil and butter. Coating it in flour before frying will add some flavor and thickness to the stew. alliums (onion and garlic), cook those in the oil and juices from the browned meat, adding more fat if needed... and usually it is. [You may also want to lightly brown the other veggies, but we chose not to this time. wine, add it after frying the veggies to help deglaze the pan, scraping those tasty bits off the bottom of the pot. It also gives the wine a little time to reduce, cooking off some of the alcohol and imparting a bit of sweetness. OK! On to the cooking! The most fun and interesting thing about open-fire cooking is the variability of the conditions. Flames and coals. Both can be hot and cold (relatively speaking). You want to build the fire in advance so that it has time to create some good red coals. The fire doesn't have to be this big to cook. Remember: We were also using it to heat the room. But who doesn't like a nice, big roaring fire? This also served us for the next morning, when we'd wake up to a still warm bed of embers that would help with lighting the morning's fire and that would more quickly heat up for cooking. Always practice good fire safety, obviously. Serve with rice, pasta or potatoes, cooked to your liking. Salt, pepper and flour the chicken, set aside. Using the same fat, and adding more if necessary, cook the onions and garlic until lightly browned. Add the wine to deglaze the pan. Allow to simmer and reduce for a bit. Add the tomatoes and the rest of the veggies. Replace the chicken in the pot, nestling them down into the other ingredients. Pour the stock or broth over the chicken, enough to cover the chicken by about a thumb's length. If you run out of broth just use a little extra water. Add the herbs and season the stew generously with salt and pepper. Stirring occasionally, sit back, drink some wine, and watch the deliciousness transpire. Allow to cook until the chicken is fully cooked and the veggies are tender but not mushy (unless you like them super soft). Plate, drizzle with a fine olive oil, and serve! Voila! What's your favorite rustic meal to make? Leave us a comment and let us know! Join us for School of Home adventures far and wide, here on our blog. New stories written by Harper Hornaday, Matthew Lardie, and guest contributors. Have a story about "home" or living creatively you'd like to share? Contact us here or at hello (at) schoolofhome.com. Thank you! Please click the link in the email we just sent you to confirm your subscription. School of Home is a new lifestyle project and blog focused on "learning through living" and creatively exploring the notion of "home." Led by writers Harper Hornaday and Matthew Lardie, our current subjects of our study include converting a school bus into a "skoolie" tiny home, exploring life as wine importers, cooking and traveling through different cultures and communities, and more. Read our story or discover our latest adventures here. © School of Home, 2016. All Rights Reserved.